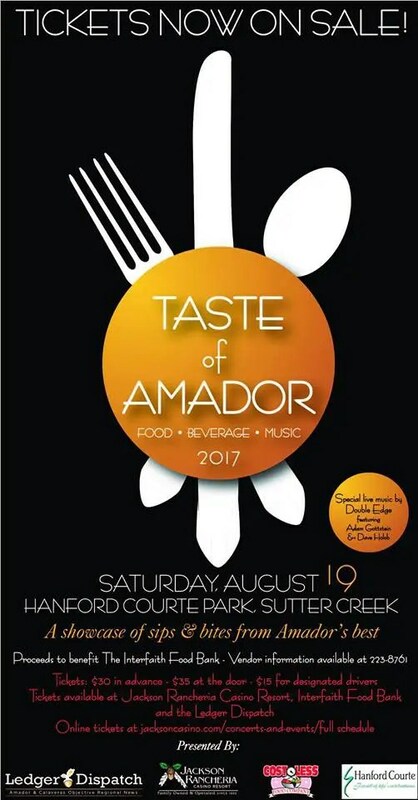 This summer food and drink event is hosted by the Amador Ledger Dispatch, in partnership with Cost Less Foods and Hanford Courte Park, to benefit the Interfaith Food Bank. The event, scheduled for August 27 at Hanford Courte in Sutter Creek, will showcase the best our community has to offer, with local wine tasting and delicious food sampling. Spread throughout the lush gardens of Hanford Courte will be stops for sips and bites from some of Amador County’s best restaurants, caterers and wineries. Guests will sample bites from places like Gold Dust Pizza (formerly Pizza Plus), Taqueria Ahi, Hotel Sutter, Choc-O-Latte and Krazy Freddy’s Beef Jerky and Salsa and taste and sip wines from wineries like Drytown Cellars, Iron Hub, Terra d’Oro, Prospect Cellars, Sierra Ridge and Cooper while special guests Giorgi Khokhobashvili and Don Price serenade attendees with gypsy violin stylings. Proceeds from this event will go to the Interfaith Food Bank, which serves more than 2,000 families and 6,000 individuals in Amador County suffering from food insecurity. Tickets can be purchased at the Amador Ledger Dispatch office, the Amador County Chamber of Commerce or the Interfaith Food Bank. Tickets are $25 in advance and $30 at the door, with designated driver tickets available for $15. For more information about the event, contact the Ledger Dispatch, at (209) 223-1767.